Enjoy mythical adventures with this awesome 3-in-1 LEGO® Creator set. 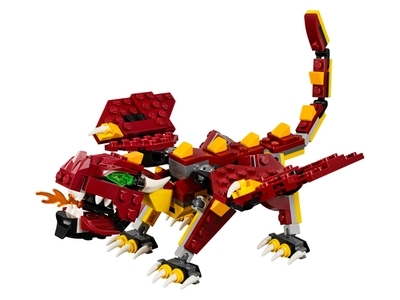 Build a roaring, fire-breathing Dragon with menacing green eyes, huge pointed claws and a fiery dark-red and yellow color scheme. Whip the Dragon’s powerful tail, fold out its wings and take to the skies! Then rebuild it for further mythical adventures featuring a Giant Spider with large pincers and creepy legs, or a mean-looking Troll with an axe that doubles as a heavy-metal guitar. Price is 42% below the initial Lego retail price, a € 7.50 discount! This comes down to 4.70 cent per brick. The Mythical Creatures (31073) Lego set is available from the sites below. However, they do not offer delivery to your selected region. The Mythical Creatures (31073) Lego set is no longer directly available from the sites below. However, 3rd party partners of these sites might still have the set available. Alternate description Create a world of scary 3-in-1 Mythical Creatures!